The Guild is a non-profit organization dedicated to advancing excellence in the visual arts through teaching, exhibits, workshops, and special events. Yvonne Aubert and the charter members wanted to foster creative camaraderie, to establish a meeting place where artists could connect. To this end, the gallery operates as a cooperative in which all members—General, Associate, and Exhibiting—volunteer assistance and become involved in the Guild’s administration. It is managed by a President and a Board of Directors who are elected at an open annual meeting. The Board recommends policy, makes changes to the by-laws, and steers the organization as it seeks to improve its outreach to the community. The Guild offers a wide range of classes, workshops, and special events to its members, ages adult through teens. The instructors are some of the most outstanding artists in the area, and in a new “Celebrity” series, nationally known artists are invited to teach workshops. Twice a year the Guild holds a juried portfolio review for those general members who wish to apply for Associate or Exhibiting Artist status (see Membership link on our website). 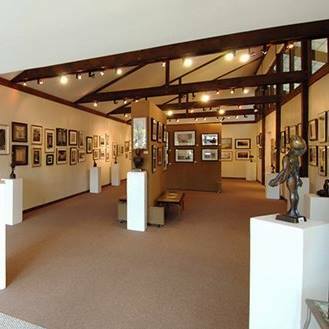 Members may participate in Guild shows and also rent the gallery space. Exhibits change monthly, with receptions open to the public. All artwork is for sale.